Last Week in Review: Despite some positive economic reports late in the week, the markets grew volatile ahead of the upcoming Fed meeting. Forecast for the Week: The Fed meets, plus key reports on inflation, manufacturing and housing. View: Finding new clients can be easy with these four tips. "I don't know where we're going, but we're on our way!" That quote from a Little Rascals episode applies to the markets of late, as uncertainty ahead of the upcoming Fed meeting has caused volatile movements for both Stocks and Bonds. Read on to learn how home loan rates were impacted. Consumers opened their wallets in August, as Retail Sales rose by 0.6 percent, buoyed by a surge in auto sales and partially offset by a decline in gas prices. 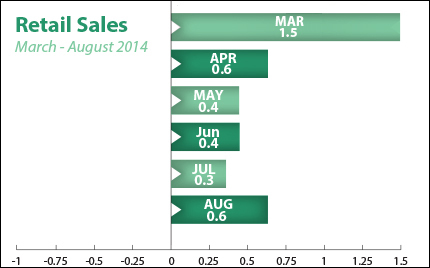 Sales for July were also revised higher. The Consumer Sentiment Index for September also came in above expectations. Meanwhile, Initial Jobless Claims rose in the latest week, but remain relatively close to the 300,000 level they've been averaging recently. In housing news, RealtyTrac reported that foreclosure filings in August, which included default notices, scheduled auctions and bank repossessions, declined 9 percent from a year earlier, to nearly 117,000. What does all of this mean for home loan rates? Positive economic news often causes money to flow out of Bonds and into Stocks, as investors hope to take advantage of gains. However, uncertainty trumped this principle last week, as both Stocks and Bonds worsened ahead of the upcoming Federal Open Market Committee meeting. Investors are nervous about what the Fed may say regarding the end of their massive Bond-buying program, which is expected to end in late October. The program has helped boost the housing industry since its most recent inception in late 2012. However, despite the recent volatility in the markets, home loan rates still remain near 12-month lows. The bottom line is that now is a great time to consider a home purchase or refinance. Let me know if I can answer any questions at all for you or your clients. An abundance of economic reports will be released, with readings on consumer and wholesale inflation, manufacturing and housing. There's manufacturing news right out of the gate on Monday with the Empire State Index, which will be followed by the Philadelphia Fed Index on Thursday. Look for news on wholesale inflation Tuesday with the Producer Price Index for August. The Consumer Price Index for August will be released on Wednesday. Housing data this week includes Wednesday's release of the National Association of Home Builders Housing Market Index. On Thursday, look for August's Housing Starts and Building Permits. As usual, Weekly Initial Jobless Claims will also be released on Thursday. In addition, the regularly scheduled two-day Federal Open Market Committee meeting takes place this week, with the Fed's monetary policy statement due to be delivered on Wednesday at 2:00 p.m. EDT. This news has the potential to shake up the markets, and could lead to added volatility in Stocks and Bonds. Remember: Weak economic news normally causes money to flow out of Stocks and into Bonds, helping Bonds and home loan rates improve, while strong economic news normally has the opposite result. The chart below shows Mortgage Backed Securities (MBS), which are the type of Bond on which home loan rates are based. When you see these Bond prices moving higher, it means home loan rates are improving—and when they are moving lower, home loan rates are getting worse. To go one step further—a red "candle" means that MBS worsened during the day, while a green "candle" means MBS improved during the day. Depending on how dramatic the changes were on any given day, this can cause rate changes throughout the day, as well as on the rate sheets we start with each morning. As you can see in the chart below, Bonds struggled in recent days but home loan rates remain near 12-month lows. I'll continue to monitor the markets and the Fed statement closely for the latest developments. 4 Places to Find New ClientsBusiness development should be part of your every day to-do list, but who hasn't had that sinking feeling that you don't have any new clients lined up? Here are four ways to take immediate action, or add business building into your daily habits ahead of time. 1. Talk to previous clients. Did you recently solve a problem for a client? If so, tell all your other clients about it—maybe they (or someone they know) have a similar problem. Call or visit them to deliver an article you've read or develop a "preventative checklist" you can pass along. The more you customize this information to specific clients, the better. 2. Dig for potential partners. Open your calendar for the last 18 months and make a list of every referral partner involved in every transaction you've performed. Using the same contact strategy from tip number one, provide value by letting them know of problems you've been able to solve since you last spoke. And don't forget to ask what they're working on! 3. Ask for referrals from everyone you know. While your clients and friends may not be thinking about your business, that doesn't mean they don't want to help. Most will happily open avenues of new business for you—but you have to ask. 4. Start speaking. Be it local chambers of commerce, trade associations, special interest groups, fairs or symposiums, one of the most efficient ways to get a group of prospects in one place is public speaking. If you're too nervous to present, offer a Q&A session, letting potential clients get a sense of your skills and personality. Plus, if you're not hosting the event yourself, you get immediate social proof and a stamp of approval through your host. Start sending inquiry letters today!